Summer can certainly be a bummer! Especially for those who have to travel a lot and face the harsh rays of the sun. Unless, of course, you are out early morning then, a dose of sunshine is good for you. I’ve seen many ladies pay through their nose for de-tanning treatments in beauty salons. (This seems to be quite popular in Bengaluru). While others swear by sun block creams, I’d rely on the use of the humble scarf. When it’s shorter in length and width, it turns into a stylish stole. A dupatta can replace a wider and longer version of the scarf so that it works as an accessory to your outfit. This also protects you from the harsh rays of the sun. When you reach the destination, it can be worn as a dupatta or folded and stored away. 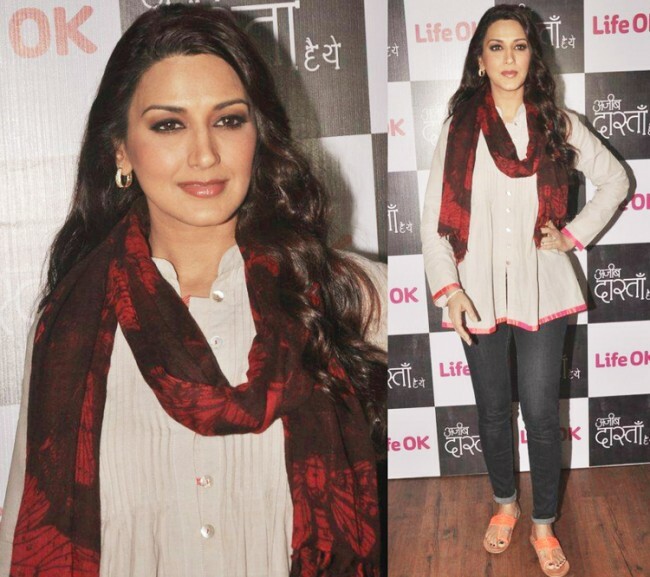 Bolywood actress Karisma Kapoor wears the animal printed scarf with so much elegance! Don’t really want to spend from your pocket? Any old dupatta or a long tunic top can be repurposed into a scarf. In Indian cities like Pune, girls cover their faces entirely with it! I found it silly initially but then I followed suit. It also gave a feeling of security when unwanted elements were around (hee hee). Which is probably why, I have so many scarves to use all throughout the year! They can be worn for any season and any reason. Stay inspired with these celebrities shots showing you how to wear the scarf in innumerable possible ways! And this is my version! (Dupatta) This one is handmade. More on Instant Batik at this link.